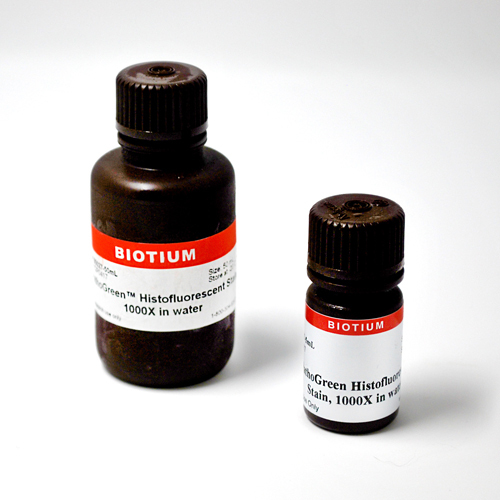 PathoGreen™ Histofluorescent Stain is an anionic green fluorescent dye functionally similar to Fluoro-Jade dyes. These dyes stain degenerating neurons and their processes after exposure to a variety of neurotoxic insults in brain sections and cultured neurons. PathoGreen™ Histofluorescent Stain is an anionic green fluorescent dye (Ex/Em 497/520 nm) functionally similar to Fluoro-Jade® dyes. These dyes stain degenerating neurons and their processes after exposure to a variety of neurotoxic insults in brain sections and cultured neurons. The mechanism of neuronal staining by anionic fluorescent dyes has not been determined. It has been proposed that the negatively charged dyes bind to positively charged polyamines or other molecules specifically generated in dying neurons. Fluoro-Jade is a registered trademark of Histo-Chem, Inc.
DCDAPH (1,1-dicyano-6-(4-N,N-dimethylaminophenyl)-1,3,5-hexatriene) is a far-red fluorescent probe that has high affinity to Aβ plaques. It has been used for fluorescent staining of brain sections and in vivo small animal near-IR imaging. Congo Red has been used in microscopy for staining elastic fibers and bacteria. Amyloid protein, an abnormal protein aggregate associated with various pathologies, is commonly detected in tissue with Congo Red. A cell-permeable dye that exhibits enhanced fluorescence upon binding to amyloid fibrils, and has been used in histology and for protein characterization. Conjugates of α-Bungarotoxin labeled with a selection of our CF® dyes and other labels. Labeled α-bungarotoxin conjugates can be used for staining nicotinic acetylcholine receptors at neuromuscular junctions in tissue sections.